Digital SLR, that has smaller image sensor size than 35mm film cameras. Therefore, angle of view of 180 cannot be obtained with Digital SLR cameras. However, it uses only the center part of the frame, therefore, peripheral distortion will be very small. You can shoot as normal ultra wide angle lens. 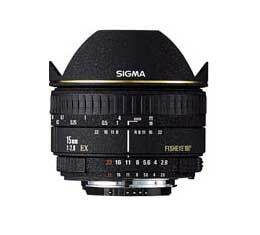 Please Note: This lens is designed for Nikon AF D Lens mount.